In recent versions of the OS X operating system, Apple changed the permissions and only root can now access floppy disks at the low level necessary to be able to read non-Mac and non-PC disks. This change may have closed a potential security hole, but it also means that emulators are no longer able to access floppy disks without the root user authorizing the access at some point. Daniele Terdina, author of Q-emuLator, has posted a blog showing how to work around this limitation for users of a QL emulator on a Mac. 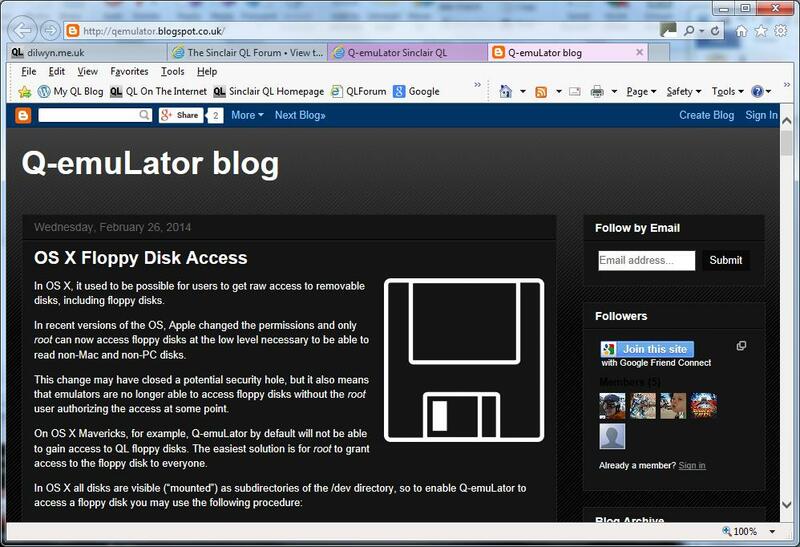 Have a look at his blog posting at http://qemulator.blogspot.co.uk/ and look for the posting entitled ‘OS X Floppy Disk Access’, posted on Wednesday 26th February. This entry was posted in News and tagged floppy disk access, os x, osx, ql emulators on 17/06/2014 by Dilwyn.